What is Messy Church ? Welcome to the website of St. Andrew & Holy Cross. Our parish churches serve the local communities of Fryerns, Craylands and Barstable East in the Essex town of Basildon. We seek to love and worship God, to grow in prayer, flourish in our faith and to joyfully live out the good news of Jesus Christ at the heart of the local community. We see ourselves as a family, inclusive of all, and hope you find a warm welcome with us. 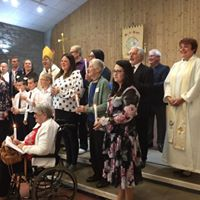 Our Vicar, Rev Jane Richards, together with Bishop Stephen and those confirmed in October at St Andrew’s. St. Andrew’s with Holy Cross has been a key player in opening Basildon’s CAP Debt Centre. Its services are local and available to everyone in the community, calling the number below is the first step in becoming debt free! Contact CAP on 0800 328 0006.